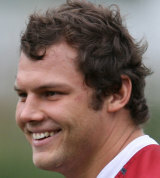 Mostert, who previously played for the Gauteng Lions, made his Super Rugby debut for the Sharks against the Chiefs in 2010. Strong showing for the Sharks earned him a call up to the 39-man squad for the tour of Europe in November 2010, although he failed to win a first cap. At teh end of the 2011 Super Rugby season he signed for French Top 14 club Stade Francais but was soon flying back to his home country as he was called up to the Springboks Tri-Nations squad following a series of injuries to their front-line second-rowers.